For an iPhone user whose life is on the way, PDF Reader is a must-have application. However, there is no decent PDF viewers preinstalled on iPhone and hunting for the best free PDF readers is a challenge because there aren’t too many that are truly free and don’t require an eventual upgrade. Moreover, what they require is more than simply reading PDF documents for most business people. Here we would recommend 4 free PDF viewers for iPhone with excellent capabilities in reading PDFs that are enjoying wide popularity. System Requirements: Requires iOS 5.0 or later. With Apple's iBooks, PDF support is front and center. 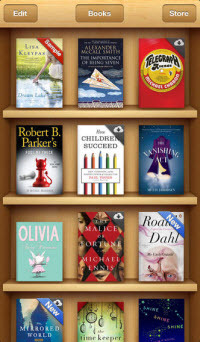 When PDFs are added through iTunes, or through App file sharing, a separate book shelf is added for PDFs. The reading experience is quite enjoyable. If you are the type who likes to keep all of your reading content in one place, you will be pleased with the free iBooks. 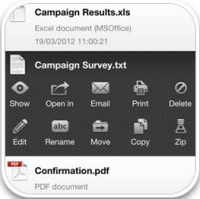 Foxit Mobile PDF for iOS maintains a similar user experience from desktops to mobile devices. It is more than a simple PDF viewer. 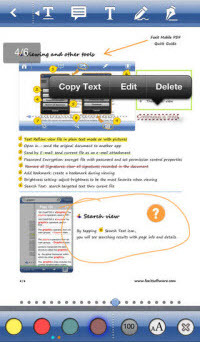 Indeed it is a PDF reader application with advanced editing features. Add and edit notes, signature and bookmarks. It is worth noting that all the comments and annotations are compatible with any PDF reader. 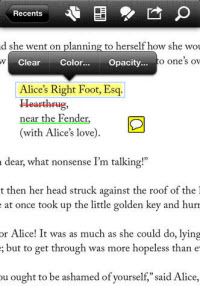 Select text to copy to clipboard and highlight with different annotations. Encrypt document using user or owner password. System Requirements: Requires iOS 4.3 or later. File App is more a file manager than a PDF reader. The application reads many files types such as PDF, Office documents and plays multimedia contents. Even though File App is a free application, it has some limits when compared to its Pro. vesrion. For example, you can only edit PDF documents with annotation, edition, comments and bookmarks in the pro version. Although it is hard to find a free and practical PDF viewer for iPhone, the four applications mentioned above will enable you to read PDF smoonthly. It is of great convenience to have a multi-funtional PDF reader installed.